With the Holiday season just around the corner, we are excited to announce that today the third beer in this year’s Fellowship will be ready for pick up! The beer, a Kriek-inspired ale aged in oak barrels with Okanagan cherries is a style we have always adored and this is, we feel, an homage to a tradition that has inspired us for years. 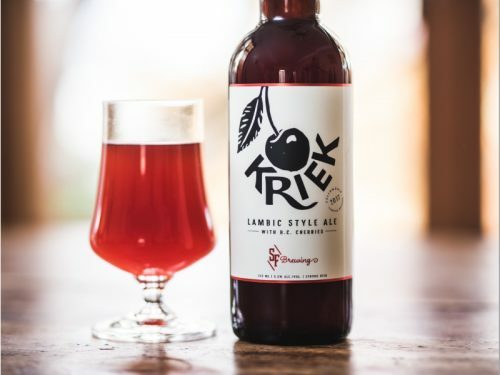 Kriek is the Flemish word for a Lambic beer made with cherries, and Lambic is a class of sour beer made using spontaneous fermentation. Just as Champagne comes from a particular region of France, Lambic comes from the Pajottenland, a valley that runs from Brussels to the South West. Because Clark Drive is not in the Pajottenland, we classify this beer “Lambic-style” in respect of a centuries-old tradition. In our opinion these are some of the coolest beers in there world. If you are familiar with the style, you will notice that our Kriek is a touch more sour than those examples from Belgian lambic producers Cantillon or Drie Fonteinen. When opening the bottle, you will be hit with aromas of vanilla, oak, and sweet cherries. The cherries we used impart a juicy fruit character, a touch of sweetness and cinnamon. Just as with the Little Red One, we recommend drinking this beer at cellar temperature rather than cold from the fridge. For more information on the Fellowship please see our Fellowship page.